Stephen Decatur Hartzell was born on July 13, 1823 in Somerset County, PA and is believed -- although not entirely proven -- to have been the son of George and Mary (Younkin) Hartzell. As a young man of 23, he joined the Methodist Episcopal Church. When he was 25 years of age, on Oct. 28, 1848, he married 17-year-old Hannah King (1831- ? ). In all, they remained in wedlock for 62 years. 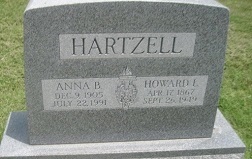 They had four known children: John Hartzell, Jeremiah Hartzell, Huldah Harrison and Howard L. Hartzell. The couple decided to push westward to seek opportunity in the flat prairie grass of the Great Plains. Two years after marriage, in 1850, they migrated to Illinois, settling near the town of Bloomington. There, their daughter Huldah was born in 1854. They remained in Illinois for about a decade and then in 1860 relocated to Texas. To his dismay, he quickly learned that his new community in Texas was strongly secessionist and supporting the newly growing Confederacy movement. "Seeing the war cloud hanging over the south," reported the Junction City (KS) Weekly Union, "he decided to lave Texas, and with his family he moved to Kansas and settled on the farm, on which place he lived and labored and formed a large circle of friends and many acquaintances." They arrived in Kansas in the spring of 1861. At some point, they transferred their church membership to the Wakefield Methodist Episcopal Church. The federal census of 1870 shows the Hartzells in Republic Township and of 1880 in Grant Township. In 1880, they lived as near neighbors to cousins John and Hila (Younkin) Faidley. Stephen added to his farm holdings in November 1897 with a quit claim acquisition of acreage in the southeast quarter of Section 34-9-4, "being the extreme southeastern section of the county," said the Clay Center Times. The Clay Center (KS) Times reported in November 1884 that he had traveled back to Pennsylvania and then returned in time to vote in the election. In 1894, he traveled from his farm east of Wakefield to Clay Center to see an appearance of some sort by presidential hopeful William McKinley. Hannah lived for another six years. She passed into eternity in 1916. Son John Hartzell (1850- ? ) was born in about 1850. He was deceased by 1910. 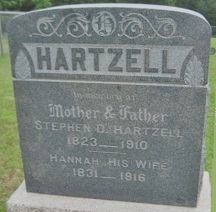 Son Jeremiah K. Hartzell (1850-1880) was born in about 1850 in Pennsylvania. He migrated to Illinois and thence to Kansas with his parents and family. In 1880, unmarried, he lived at home with his parents on a farm in Grant Township, Clay County, KS. 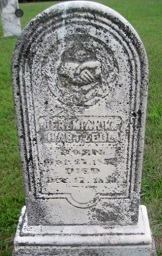 Heartache rocked the family when he died later that year on Dec. 17, 1880. Why his demise at such a young age is not known. No obituary had been found in the Junction City Weekly Union. Daughter Huldah Hartzell (1854- ? ) was born in about 1854 in Illinois. She married John Harrison ( ? - ? ). In 1916, the Harrisons sold their interest in a local farm tract to Huldah's brother Howard. The land was in the southeast quarter of Section 34-9-4. Son Howard L. Hartzell (1867- ? ) was born on April 17, 1867 in Kansas. In August 1895, he dwelled in Myersdale, Clay County, and spent some time visiting Oklahoma. When the federal census was taken in 1900, Howard was marked as widowed and lived with his parents on their farm in the Grant District of Clay County. He married a cousin, Cornelia Faidley (1869-1904), the daughter of John Peter and Delilah "Hila" (Younkin) Faidley and granddaughter of Henry F. and Mary (King) Younkin. Cornelia and Howard had no children. To pass the time, she enjoyed visits with her aunt in Clay Center, Cassie Myers. Sadly, Cornelia died on June 25, 1904 at the age of 34. The cause of her untimely passing is unknown. Her remains were interred in the Timber Creek Cemetery, where many of her Younkin family members also rest for eternity. Now widowed, Howard spent many years alone and moved back into his parents' home. During that time, he earned a living as a laborer in a local sawmill. In 1907, the Junction City Weekly Union reported that he "has been spending several days here the guest of Miss Hattie Yeo at the home of her sister, Mrs. Frank Root." In about 1927, Howard married again, at the age of 59, to 21-yeare-old Anna B. (1905-1991). There was a 38-year gap in their ages. Evidence suggests that they did not reproduce. Anna survived him by a not surprising 42 years. She passed on July 22, 1991, and is side by side with her husband at Highland. Research for this page graciously shared by the late Olive (Rowan) Duff, the late Donna (Younkin) Logan and Marlyn Hartzell Dalsimer, a.k.a. Marlyn Klee-Hartzell.